1) Using the hip-length dress foundation as in style 1, trace front and back to waistline only; then extend the front waist dart up to level of the side dart as indicated. 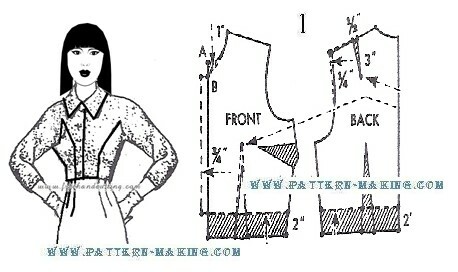 Lower neckline 1” at center front, and extend front 3/4" beyond center front for front closing overlap; then shorten front and back 2” as indicated. Instead of the 1 . . .